Flying cars, formally known as electric vertical takeoff and landing aircraft, or VTOLs, may not be suitable for short trips, researchers report. However, VTOLs—which combine the convenience of vertical takeoff and landing like a helicopter with the efficient aerodynamic flight of an airplane—could play a niche role in sustainable mobility for longer trips, according to the study. Several companies around the world are developing VTOL prototypes. Flying cars would be especially valuable in congested cities, or in places where there are geographical constraints, as part of a ride-share taxi service, according to study authors. “To me, it was very surprising to see that VTOLs were competitive with regard to energy use and greenhouse gas emissions in certain scenarios,” says Gregory Keoleian, senior author of the study and director of the Center for Sustainable Systems at U-M’s School for Environment and Sustainability. “VTOLs with full occupancy could outperform ground-based cars for trips from San Francisco to San Jose or from Detroit to Cleveland, for example,” he says. The new study, the first comprehensive sustainability assessment of VTOLs, looked at the energy use, greenhouse gas emissions, and time savings of VTOLs compared to ground-based passenger cars. Although VTOLs produce zero emissions during flight, their batteries require electricity generated at power plants. Akshat Kasliwal, first author of the study and a graduate student at the School for Environment and Sustainability at the University of Michigan, says the findings can help guide the sustainable deployment of an emerging mobility system prior to its commercialization. “With these VTOLs, there is an opportunity to mutually align the sustainability and business cases,” Kasliwal says. In the coming decades, the global transportation sector faces the challenge of meeting the growing demand for convenient passenger mobility while reducing congestion, improving safety, and mitigating climate change. Electric vehicles and automated driving may contribute to some of those goals but congestion on existing roadways limits them. 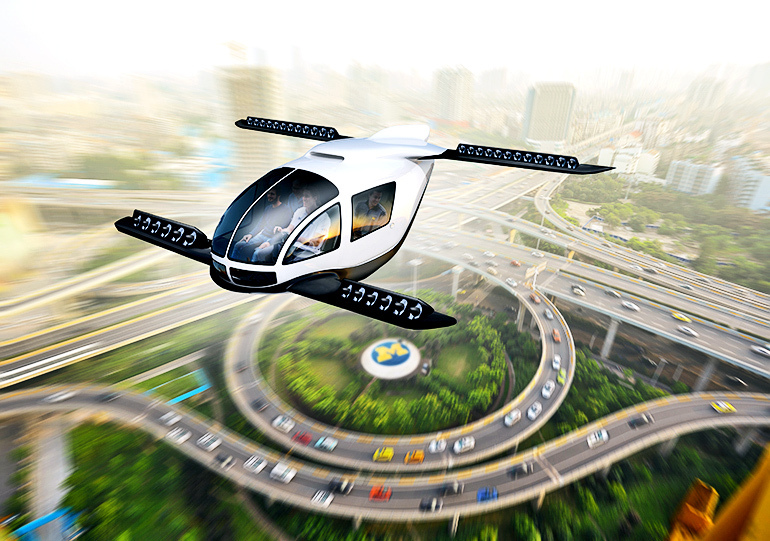 VTOLs could potentially overcome some of those limitations by enabling piloted taxi services or other urban and regional aerial travel services. Several aerospace corporations and startup companies—Airbus, Boeing, Joby Aviation, and Lilium, for example—and agencies such as NASA have developed VTOL prototypes. One critical efficiency enabler for these aircraft is distributed electric propulsion, or DEP, which involves the use of several small, electrically driven propulsors. The researchers used publicly available information from these sources and others to create a physics-based model that computes energy use and greenhouse gas emissions for electric VTOLs. “Our model represents general trends in the VTOL space and uses parameters from multiple studies and aircraft designs to specify weight, lift-to-drag ratio, and battery-specific energy,” says coauthor Noah Furbush, a master’s student at the College of Engineering. “In addition, we conducted sensitivity analyses to explore the bounds of these parameters, alongside other factors such as grid carbon intensity and wind speed,” says Furbush. The researchers analyzed primary energy use and greenhouse gas emissions during the five phases of VTOL flight: takeoff hover, climb, cruise, descent, and landing hover. These aircraft use a lot of energy during takeoff and climb but are relatively efficient during cruise phase, traveling at 150 mph. As a result, VTOLs are most energy efficient on long trips, when the cruise phase dominates the total flight miles. “As a result, the trips where VTOLs are more sustainable than gasoline cars only make up a small fraction of total annual vehicle-miles traveled on the ground,” says coauthor Jim Gawron, a graduate student at the School for Environment and Sustainability and the Ross School of Business. “Consequently, VTOLs will be limited in their contribution and role in a sustainable mobility system.”Not surprisingly, the VTOL completed the base-case trip of 100 kilometers much faster than ground-based vehicles. A point-to-point VTOL flight path, coupled with higher speeds, resulted in time savings of about 80 percent relative to ground-based vehicles. “Electrification of aircraft, in general, is expected to fundamentally change the aerospace industry in the near future,” Furbush says. The study’s authors note that many other questions need to be addressed to assess the viability of VTOLs, including cost, noise, and societal and consumer acceptance. The study appears in Nature Communications. Additional coauthors are from Ford’s Research and Advanced Engineering team in Dearborn, Michigan.